Thanks for such a thorough write up - I'm looking forward to seeing what people think of it after all the buzz. I'm really curious, though, how they're justifying the "end of fingerpricks" statements - even ignoring the advice to check by pricking if you're changing rapidly etc (and I assume before doing things like driving?) All the other cgms are very specific about not using them to bolus/treat. I appreciate it's not a cgm, but it's still testing interstitial fluid, so I'm not sure where the increased confidence comes from (and I will totally hold my hands up and say that I have bolused and treated hypos on the basis of my cgm on several occasions, bad diabetic that I am ;) ) Has there been any feedback from HCPs on this? I have to say that, for me, the cost comparison between the Flash and my dexcom/vibe is pretty much the same, as I get about 4 weeks out of each sensor and so it come to about the same yearly cost as the Flash, but I love that the upfront cost is so much lower on this - it seems like it will be much more affordable for people who just want to pick one up every so often, which is much more expensive with the other cgms. It looks great - thanks Mike for the great write up. We now have to wait until it licensed for under 18s. Thank you very much for such a lot of informations! We all are looking forward to the end of fingerpricks! Many greetings from Germany! Thanks for the comments folks! Angie - in answer to your question, I confess I'm not entirely sure. The language Abbott are using seems quite carefully phrased to me and they are certainly being very clear about a range of circumstances when the Libre's results may differ from SMBG. I'll be interested to see what I get after 14 days, but aside from a few readings where things have been rising/falling rapidly I have been very impressed. Certainly not much more variation than I would expect between, say, two different brands of BG meter testing the same drop of blood. I had a quick skim-read of the manual to see whether the Bolus Calculator in the Libre would accept swiped readings for dose calculations - that would be quite telling. I'd need to check with Customer Services and/or dig a little deeper, but it looked initially as though you would need fingersticks to calculate doses. As I said in the review, I am almost tempted to use my second sensor to 'fly solo'. Not something I think Abbott would officially advocate, but most of my swipes today for example have been only a few decimal points away from SMBG readings taken at the same time. After all it's not as if BG monitor results themselves are exactly flawless! My three years old daughter was diagnosed about three weeks later. Her BG is still not very controllable and we struggle to cope with finger pricking especillay when she is sleep.I amm considering freestyle libre but have to concerns. First whether the sensor is going to fit her tiny arm or not? the second is that he might remove the sensor, What do you think friends?? Yes, I was on the trial and it is not completley reliable. The sensor comes off if your hot & sweaty, the machine does not always match my results with my normal machine. I personally think three is a little young. This sensor still has to be pricked on which she may find distressing, but if this machine is eventually fine tuned its will be fantastic. My daughter received a free starter pack and has been using the libra for a month. I think once your daughter realises the benifits of painless testing she even at three will succumb to benifits ( my daughter has had type1 since she was one and since using the scanner her fingers have gone from rough and hard to lovely and soft) the sensor is the size of a two pound coin so offer it up and see! 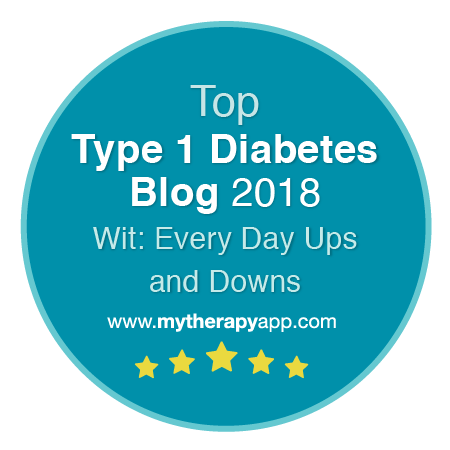 The benifits to you as a mum will be great as the information about her blood sugar levels is far superior and I have found it is more reassuring to make control decisions, by the way the adesive on the sensor is very strong. My daughter is under 18! Hi anonymous. You won't be able to use the Libre, certainly not yet. It is currently for over 18s only. Abbott are trying to get a paediatric license, but can't say how long that might take. Hi Vish, As far as I am aware NICE have not yet given any CGM technology a formal 'Technology Appraisal'. 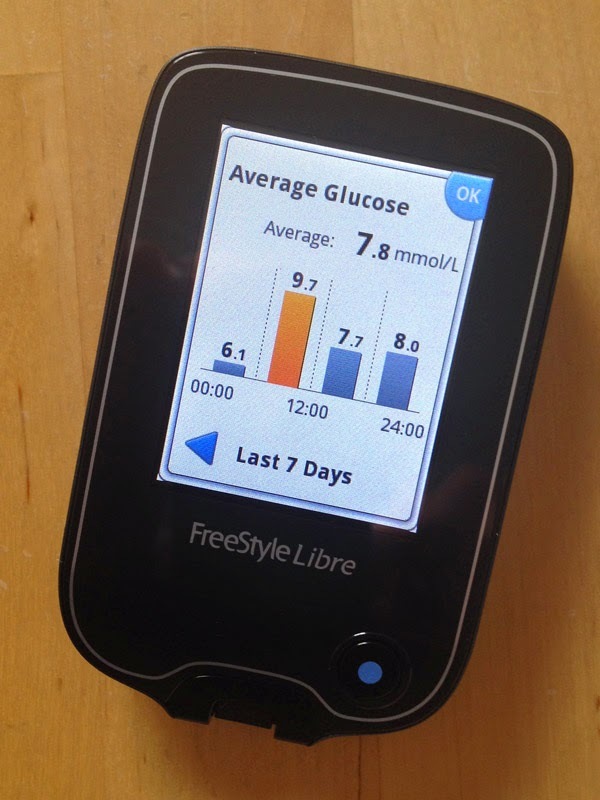 My guess would be that the Libre would more or less fall into CGM territory for the NHS. I know Abbott have been keen to engage HCPs, but from what I can see you would still need a sort of 'special circumstances' type funding arrangement to get the sensors funded by the NHS. Certainly worth asking the question though! Thanks for the great review. I'm from Brazil and I will be in Paris in the middle of October. I hope to be able to buy the starter kit while I'm there. Do you know if Abbott has plans to do an Android app, so people with smartphones with NFC capabibilities would be able to make the readings without the need of carrying the meter? I didn't hear any mention of NFC/smartphone option being anywhere in the pipeline (though that doesn't mean it won't happen at some point). I suspect it's a bit of a long shot though, because of the regulatory approval needed for medical devices, which I believe would cover an app on a smartphone in that situation. My guess would be that the Libre-using-Android-owning overlap would be pretty small too, so I think it's a bit of a niche market. Sorry for the double post. In both of them, I used the option to post using my Google account, so I wonder why it didnt use my name instead of anonymous or unknown Btw, the first try I clicked in the preview (not publish) button and the comment disappeared. I wrote everything again and this time clciked the publish. Seems that comments using Google account has some defects. I get that Abbott are saying it is not licensed for children, but how exactly can they stop parents from purchasing this under their own name and putting it on their kid? After all, interstitial fluid doesn't exist only in adults, right? I know if my kid had diabetes, i'd be buying one tomorrow - even if it is unlicensed! Well, I suppose, they can't. And neither could they prevent an adult from inserting a sensor in other locations than the back of the arm (the only currently licensed location). I seem to remember much hoohah about delays in the licensing of Dexcom sensors for paediatric use too. But the regulatory process is what it is, and it is there for good reason. Medical history is littered with unfortunate, unforeseen outcomes that no-one could have predicted from the use of phamaceuticals and devices. Most of the disaster/horror/apocalypse/zombie takeover movies I have ever seen revolve around a medical breakthrough that goes horribly wrong - though to be fair I doubt the Libre has the potential to zombify anyone. 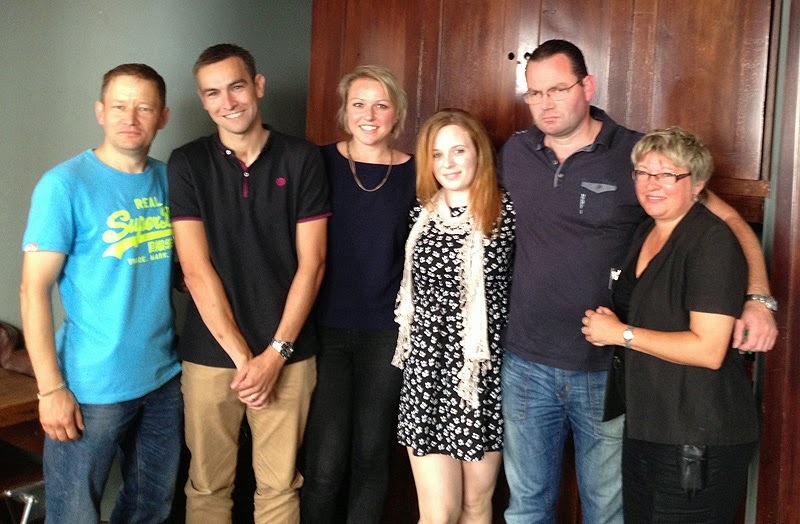 Would the Libre safe, effective and reliable in use for people under 18? Seems likely to my uneducated eye, but actually I have no way of knowing. And nor do Abbott. And nor do any parents. I did try to ask if Abbott had any concerns/expectations over acquiring the license for paedatric use and/or the possibility that some parents in desperation might go 'off label', but I could not manage to phrase the question in such a way that Abbott could legally offer an answer. Do you think the sticky bit is sticky enough that it will last 14 days? No its not. I used four sensors in a week whilst on the trial. I recommend that people are aware once they lose their stickyness it cannot be reattached, costly even more money. Until this becomes free under NHS it is too costly for an average person. Sorry you've had adhesion issues Anonymous - not something I have had an issue with in the years I have used sensors. I think perhaps it has to do with skin type? Might be worth considering Skin-Tac or another similar preparation if this is an issue for you? Personally I have to gently ease them off at the end of sensor life as they are still very-much stuck fast for me. It's that arrow that I've been looking for ever since diagnosis! - surely worth a try for the initial pack? The cost looks very comparable to using the number of test strips that I do, we must be able to convince NICE/NHS? And if we all stop using test strips, the other meter suppliers will get on with developments, hopefully with reduced costs too. Really looking forward to your next post on this, also read the others you recommended, thanks. I am definitely in the maket for this! looking forward to purchasing this - anyone got an idea of a release date? hello, just wondering if it only shows you the numbers that you've flashed when displaying the previous 8 hours or if its all readings that the sensor picked up (like a regular cgm)? Hi, would be good to have an update on how the trial is going, would you still say it is an 'amazing' piece of kit and do you know when we can all have one? I've never used a CGM, so I'm not entirely sure I understand war you mean by 'all of its readings' You certainly get to see the trace which you can use to estimate glucose levels at any point - the 8 hour trace is very useful for this, though the on-screen 24hour is a bit on the small side. There are also a number of very useful PDF reports you can generate if you choose to download the meter to your Mac or PC. Ceri - Yes I'm still convinced by it. I have a blog post I am desperate to write (frustrations of time!) which compares the readings I have with the fingerstick BGs I took at the same time. 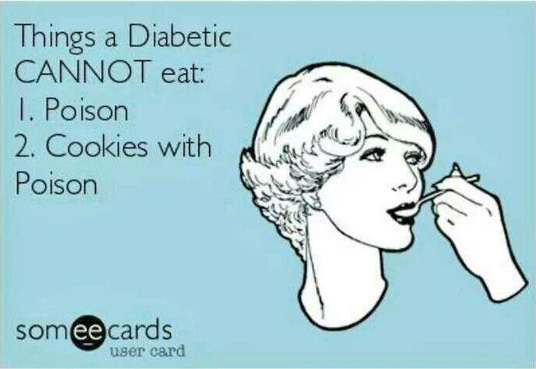 In my case they make pretty compelling readings and while some are considerably out (2mmol/L) many are within a few decimal places. 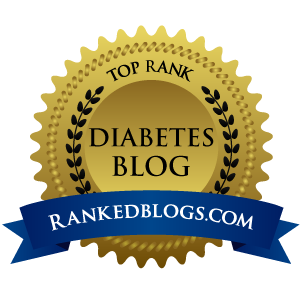 The average difference was +/-0.8mmol/L. My second sensor did not quite live up to the first but there was apparently a manufacturing glitch in some of the very early sensors which has now been fixed. My second sensor ran out on Friday lunchtime and I have missed the reassurance of 'check anytime' massively. I am intending to purchase some sensors when they become available, which I *think* is due to be late October/early November. I guess that would partly be down to the FDA - though I'd imagine the US is a market that Abbott are keen to access as soon as they can. Fingers crossed the approval comes through soon. The sensors are rated IPX7 which means they are fine for immersion (including swimming on the surface) for up to 30 minutes. I have seen reports of people swimming for 45 minutes without problems - I'm not sure if they added a little overprotection such as opsite flexifix though. hello everyone , please tell where can i find the checker?? i really need it . My diabetes nurse tells me that this will probably be available in Canada in the New Year. I don't have a cgm as yet because I have only recently started the Omnipod after 45 years of injections. I decided to hold out for the Libre after my nurse explained it to me. He went to a seminar and I believe it was demonstrated there. I would dearly love to be able to check my bg while I am out and about - I think it would give me far more confidence. Are Abbott considerring the Free Style Libre for an Australian release yet or at all ? 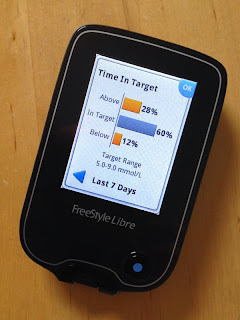 Your best bet is to check www.freestylelibre.com for availability/regulatory approval in Australia. Hi ! Congrats for the post, you have no idea on how helpful and inspiring it was to me ! I'm a brazilian and i am planning to travel to uk or spain just to buy one of this. I have two doubts: 1) How you remove the sensor and is it painful ? 2) I wonder if i can freely go to a pharmacy and buy it, or i have to present a prescription ? I can only advise that it is not painful & you can only buy this online. Hi Anonymous, The sensors peel off after 14 days. No more painful to remove than an infusion set or sticking plaster. 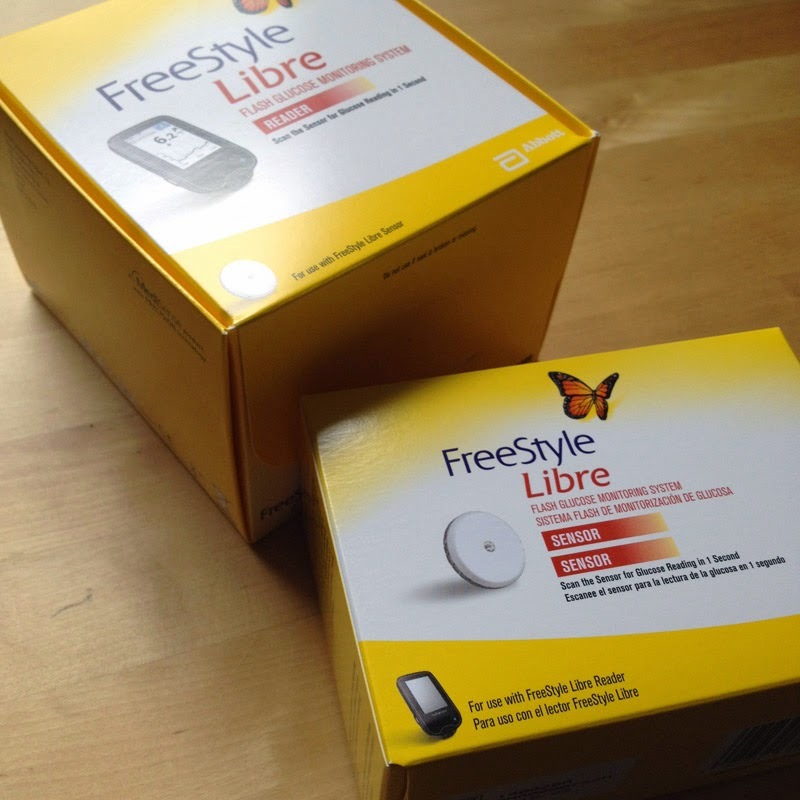 Libre are not for sale in a retail environment like a pharmacy or chemists - you can only buy them via the Freestyle Libre website. You can check the .com version to see about availability in your country. How much does this meter and the sensors cost? I use sticks and using the dafne rules go through numerous sticks a day. I have been a type one diabetic for 37 years and I am sick of the daily scourge of finger pricking. I am from the UK. See 'What does it cost' above. Starter pack or reader and 2 sensors would be just over £130. Currently demand exceeds supply and Abbott stopped taking new customers in the Autumn, and still haven't re-opened the gates - which annoys me intensely as I missed the boat for signing up! 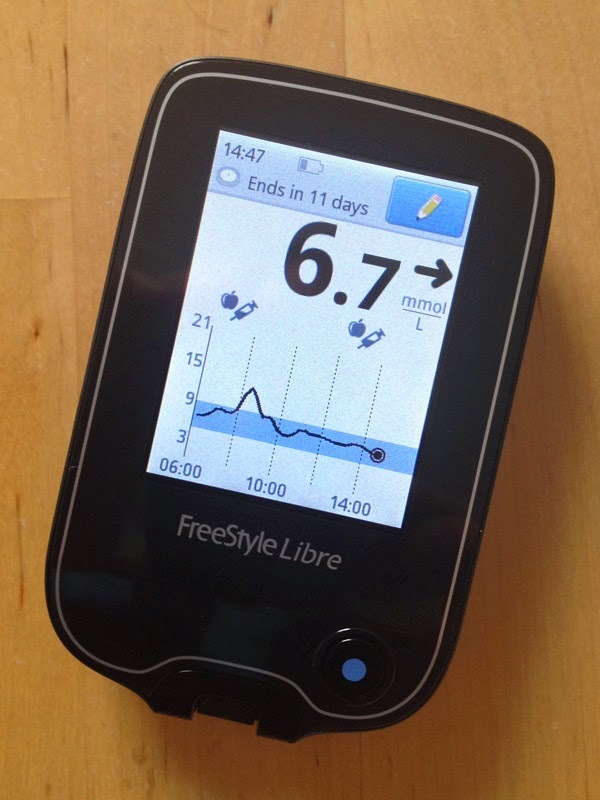 You can sign-up on www.freestylelibre.co.uk and they promise to let you know when you can place an order again. Sorry about that - didn't receive it (they are all screened before publishing). Do you know if the sensors are safe to go in an MR scanner? I'm a Radiology Nurse and often have to go in these scanners, and wouldn't want the magnet to pull the sensor out of my arm if there is any metal in it. "Do patients have to remove the sensor during MRI/CT scan? Yes. The sensor should be removed prior to exposing it to strong magnetic or electromagnetic radiation, for example an X-ray, MRI (Magnetic Resonance Imaging), or CT (Computed tomography) scan. The effect of these types of procedures on the performance of the system has not been evaluated." If in any doubt, I'd suggest calling Abbott's helpline. They will know for sure. Thanks! 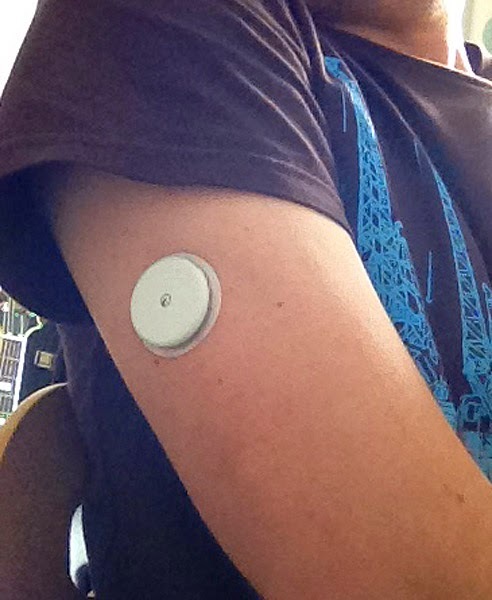 Abbott are actively pursuing FDA approval for the Libre in the US. If I hear any more information about that I'll post an update. From what I can gather it is very hard to estimate how long the approval process might take. can we from the Us purchase it and have it mailed here? No. As far as I know, the libre will only be available in the U.S. After FDA approval. Hi Mike. Thanks for all the work on the Libre. I just received a starter pack here in Canada from a German friend and am having trouble with the German (40 years since I last worked in the language). Would anyone have an English manual in pdf? Just to make sure I don't press the wrong button. Thanks. Google Translate suggests your initial post was in Romanian - unfortunately, as far as I know the Libre is still only available in the initial launch countries of UK, France, Germany, Italy, the Netherlands, Spain, and Sweden. Libre readers and sensors can only be sent to those countries at the moment. Hope it launches more widely across Europe for you soon. In Spain we cannot buy the Libre. We have contacted Abbot subsidiary in May and they told us they run out. We are on a waiting list since then and nothing.:-(. Even friends who bough it on Nov´14 don´t have the sensors. second Q, Why it is allowed for over 18 years only ? Why i couldn't use for my 10 years old daughter ? Q1. Abbott say sensor accuracy is likely to be less reliable on Day 1 (but still often within reasonable limits). Many users seem to find that the first 24 hours is likely to contain more differences between blood and sensor. Some have even taking to inserting the sensor slightly early and then waiting before activating it, though this is not advised by Abbott. My experience is that when a sensor reads very differently in the first 24 hours it may well settle after 36-48 hours. If it runs very different to BG for much longer than that contact Abbott and they can check the setup and may replace it free of charge. However keep careful notes, because more than once I have *thought* that a sensor was really misbehaving when actually the differences were more down to the inevitable variations between BG and interstitial glucose (e.g. when BG is moving rapidly, if dehydrated, pressure on sensor). 2. Abbott got the approval for adults first, but they need separate research results and approval for under 18s. I don't think they are expecting any problems with under 18 approval, but the process takes a long time to complete. It is certainly something they are actively pursuing. I have seen some parents on Facebook who are already using Libre with their children as they cannot bear to wait. I tried the Libre system back in April this year. After 3 days I visited my local Supermarket and the security gates killed the sensor dead. I am about to try the system again and wonder if you or any other users have been able to visit Supermarkets without this happening. Abbott's Technical Support suggest that some gates are set to a higher power than necessary. They will replace any sensors damaged in this way but that will still prevent me visiting the same shop without it happening again. I think Abbott's should have sorted out this problem before launching the product. Sorry to hear your experience - I've not heard of people having trouble with supermarkets (I wore a sensor over the last few weeks and went in and out of shops/supermarkets without bother) though I have heard problems with Libraries. Perhaps it depends on the system? I would phone Abbott and explain what happened - they may replace the sensor and ask you to return the old one to them. This all sounds wonderful after 4.5 years of pricking my 5 year old daughter. It is now licenced for children so will be ordering a kit tonight. Can't wait not to find the toes in the middle of the night! Thank you! Very interesting reading yor comments thank you all. I am on week 3 and loving it and hoping sometime soon it will come down in cost . Does anyone know if it is affected when it gets very hot as I sat today in a pub with the sun streaming through the window and my arm got very hot and I wondered if it would affect the sensor? Also does airport security scanners affect the sensors too? Can anyone please advise how I can go about applying for a two week trial.Thank you. No funding available as not accepted by NICE for NHS prescription so ongoing use has to be self funded. There is no funding in the UK for Libre and this product has not been passed by NICE so cannot be paid for on NHS prescription. Costs will have to be paid for by yourself. Great reading BTW cool control. Does anyone know if its suitable for a 1 year old? Abbott have obtained a license for use in children aged 4-17. Perhaps because of the length of the filament/needle (I am assuming u18 use is licensed for back of arm as adult use is??). You might be better off asking in a group Facebook group for others' experiences? 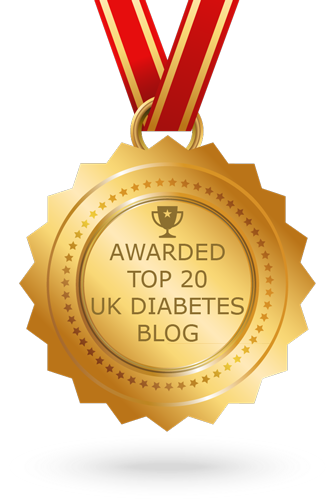 Perhaps https://www.facebook.com/groups/748445301888935/ or the Children With Diabetes (CWD) UK group? I've never had a problem with sensor adhesion at all - even where I've gently knocked sensors they have stayed firmly stuck. I am careful not to put too much stress on the adhesive in the first 12 hours or so, but only because my experience with insulin pump sites on my back/sides is that of you twist and stretch them too much and the adhesive 'gives' early on they they never stick quite as well after. I've never has this problem with Libre sensor, but I'm cautious as I'm self-funding! Having said that, I would contact Abbott who can troubleshoot the application process and will usually offer a free replacement if the sensor adhesive may have been faulty. My freesttyle reader stopped working 2 weeks ago, I have not been able to talk to a customer service rep and have had no response from by email or voice messages. When working the system was great by reader failed after only 6 weeks. I am significantly out of pocket & with the non existent customer services support, would not recommend. That sounds rubbish Anon. For what it's worth, I gather that email is far less likely to receive a prompt response than a phone call. My reader stopped working reliably after about a year (the button needed to be pressed increasingly firmly) and Abbott replaced it free of charge. I'm not sure which number you used as I've never found one which prompted me to leave a voicemail message - it was just a matter of waiting in a queue until someone was available. Perhaps it would be worth trying again during office hours? Seems a shame to waste all that money when I'm sure Abbott would replace your handset for you.